Mina (SM Lost Thunder 138/214) is a Supporter card which lets you search your deck for a Fairy Energy and attach it to one of your Pokemon….without any built in cost or restrictions, besides using up your Supporter for your turn. Since it grabs a Fairy energy from your deck, it thins your deck by one card; and because it attaches it to your Pokemon instead of your hand, you get to manually attach another Energy. Given what she does, she can be a useful addition to existing decks. -Gardevoir-GX can benefit from Mina to get a Y energy, followed by its own – or multiple – Secret Spring abilities, and attaching a Double Colorless Energy/Super Boost Energy to amplify the damage output on Infinite Force. Using Mina, Super Boost Energy, Choice Band, and FOUR Secret Spring, and you go from zero to 300 damage, enough to OHKO the biggest Pokémon in the game, which currently is Magikarp & Wailord GX with 300 HP! -Xerneas Break would also benefit with Mina, fulfilling one of the energy requirements of Life Stream, which would also be covered by a manual attachment of Y Energy. Though the damage scaling is weaker than Gardevoir-GX or Gardevoir-EX, 20x is still good for certain targets. With Mina, manual Y attachment, FOUR Naganadel’s Charging Up ability, and Choice Band, you went from zero to 150 damage! -Granbull would benefit from Mina as she fetches a Y energy from your deck to this Pokémon, while lowering your hand size by one. Keep in mind that I was unrealistically giving examples, but players can pull this off if they want to, just not frequently. Still, she provides energy acceleration and will be welcomed by decks using Fairy Energy. And that’s before factoring adding other energy accelerating items such as Max Elixir and Ether! Mina (LOT 183) debuts in the Pokemon TCG out of the Lost Thunder expansion set. This Supporter card allows you to search your deck for a single Fairy energy and attach it to any of your Pokemon. Because Gardevoir GX needs more energy acceleration. Seriously: DCE from hand, two Secret Springs, and a Mina means that you go from zero to five energy in a single turn. Mina means your Granbull probably will never miss an attachment. And it doesn’t even have to be a Fairy Pokemon, we’ve seen this work great with Solgaleo GX (SM104). I don’t know that this is a four of in every Fairy deck, but it probably won’t hurt you to carry at least a couple, especially if you have Swampert to help put cards into your hand every turn so you don’t have to rely on Supporters for drawing cards. Definitely a valuable addition to any deck with Fairy energy. The Trial Captains come in all shapes and sizes. Some lead you around different areas, some require you to complete specific challenges, and all of them have an encounter with some kind of Totem Pokemon…well, unless you play Sun and Moon, in which case SOMEBODY is too busy drawing things to come up with one until Ultra Sun and Ultra Moon. Mina is a Supporter that works really well in Fairy decks, letting you directly attach a Fairy Energy from your deck to one of your Pokemon. Good way to thin the deck, gets the Energy you need – pretty solid overall. The real question might be whether or not she’s worth your Supporter for the turn, and that’s going to depend more on the situation. Obviously it’s more useful to have early on when you want to charge up your Pokemon than it would be later on when you’re struggling or your deck’s Energy count is low. Probably somewhere around 2-3 is the right number, but feel free to experiment with Mina in all of your Fairy-based decks! Arora Notealus: Funny enough, I didn’t end up getting around to Ultra Sun/Ultra Moon, so I didn’t know that Mina had a trial. Turns out, it’s a really nice trial too, and it sounds like a really sweet and meaningful trial. Not to mention that it might have been hard to implement the other idea of drawing a Ribombee – what is this, Pokemon Art Academy? Side Review: Onix – seems like a really meh card overall, but it apparently warranted review? Turns out that’s mainly because of the attack’s cost being completely Colorless, making it worthwhile to throw into decks that otherwise wouldn’t have Fighting-Type Pokemon in them, and this makes for a common counter to Fighting-weak Pokemon like Zoroark-GX, who’s been pretty prominent in the format. Go figure! Whitney – arguably one of the worst draw Supporters in the game, Whitney aims to get better by playing more copies of Whitney. You draw 1, then 3, then 5, and then finally 7, based on the other Whitneys in your discard pile, but rather than playing 4 Supporters like that, why not play 4 Cynthias or 4 Professor Sycamore in Expanded? There are generally better, more consistent options for most decks, and there’s not really a reason to run Whitneys over those options most of the time. Another way of thinking of this is that it’s Whitney, then Hau, then a better Judge, and then a Hala without the need for a GX move. 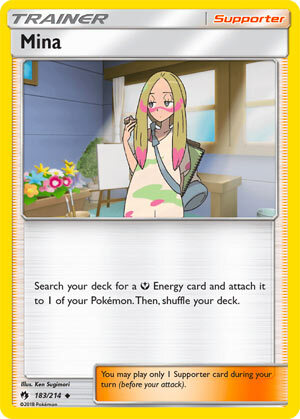 Mina (SM – Lost Thunder 183/214, 211/214) is a Trainer-Supporter that lets you search your deck for a [Y] Energy card and attach it to one of your Pokémon. Only basic Fairy Energy cards count as [Y] while in your deck but notice how you may attach that Energy to Pokémon of any Type. You’re giving up your chance to use Cynthia or Guzma or any other Supporter that turn, but you’re getting a bonus Energy attachment right from your deck. You’re only searching and attaching a single Energy with each use, but that also means attaching from the deck remains pretty reliable. We’ve actually got three other Supporters that attach Energy to compare and contrast with Mina: Blacksmith, Kiawe and The Masked Royal. There are also several Items which attach Energy, like Beast Ring, Aqua Patch, Dark Patch, and Max Elixir. I’m not going to go into a huge amount of detail when it comes to these other forms of Trainer-based Energy acceleration. I started to, but quickly realized I was burying my points. All other things being equal, Items are often better than Supporters. Besides the nature of the effects, all other things are never equal due to anti-Item effects, Tapu Lele-GX, and VS Seeker. Attaching from the discard pile is usually the best, though it can be a bit tricky early game; searching and attaching from the deck is the second best form of Energy acceleration, however. Attaching any Energy is best of all, but none of the cards I named do that; attaching any kind of basic Energy is better than being restricted to just one Type, but everything capable of doing that has additional attachment restrictions, complications, or conditions. Attaching to Pokémon of any Type clearly is the best. Okay, okay… so far, Mina is definitely not the best option for this trick, but she’s doing alright. She can’t really hope to compete with the Item-based options but she’s looking better than The Masked Royal and maybe on par with Kiawe (ending your turn is that significant of a drawback). Which gets us to something I’ve noticed: out of everything I listed, it seems Aqua Patch, Beast Ring, and (in Expanded) Max Elixir are still seeing significant usage. Maybe the Expanded-only options are just being hurt by the lack of data available; the one seventh-place finisher running Blacephalon-GX/Volcanion-EX at the Champions League Niigata Extra maxed out on Blacksmith, but second-place Flareon (BW – Plasma Freeze 12/116)/Vespiquen (XY – Ancient Origins 10/98) deck no longer does (past builds sometimes did, sometimes didn’t). Kiawe and The Masked Royal don’t have those excuses. Kiawe used to be huge, but only some Blacephalon-GX decks still run one copy, at least in the higher finishing results Limitless reports. The Masked Royal never really made it. Now, why does all of that matter to Mina? She doesn’t end your turn and she doesn’t only work with certain Types of Stage 2 Pokémon to attach from your hand. The two current, competitive [Y] decks just can’t make efficient use out of her. Gardevoir-GX decks already have that card’s “Secret Spring” Ability to attach extra [Y] Energy from hand. Grandbull (SM – Lost Thunder 138/214) decks are built around using Granbull’s “All Out” attack, which only requires [Y] in the first place. If those decks had room, sure they’d still run Mina… but they don’t have room, in Standard Format play. In the Expanded Format, the two decks I named may not even exist (they weren’t showing up in the top cut results). If they did, I’d think VS Seeker would make Mina easier to use. Mina is probably a must-run in the Limited Format; as long as you’ve got something with [C] or [Y] Energy costs, you probably can spare a Supporter for that precious Energy acceleration. Mina hasn’t earned the above scores yet. She actually has solid future prospects. It is possible that we’ll never get another [Y] Energy user (or even [C] Energy user) that won’t have better options, but that seems less likely than us getting something where Mina matters. Even if only because it winds up being two years later when the powers-that-be have forgotten Mina even exists. Plus, one Gardevoir-GX shortly after Mina released did include her as a single and managed a 59th place-finish at the Roanoke, VA Regional Championship.